Have you read about the Indian guy who has been replanting trees on a river island since 1979? Today, “his” forest is rich in wildlife, and he is the subject of an inspirational documentary. More on that later, but first, here’s your chance to be involved in something similar right here in Bellingen! Bellingen Island, the only significant patch of lowland rainforest left on the Bellinger floodplain, is growing! The Western end of Bellingen Island is being expanded through planting local native rainforest species by Bellingen Urban Landcare (BULC). But to do this the group needs your help. Help us build a rainforest this Sunday 28th May from 9am till midday. 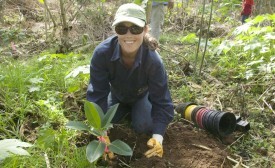 You will be working alongside qualified bush regenerators and ecologists. All tools, supervision and morning tea will be provided by BULC. Chair of BULC Tim Scanlon said “Expanding the Island’s rainforest increases the diversity of plants and habitats, and helps to protect it from weeds and the impacts of floods”. The island also provides roosting habitat for the endangered grey headed flying fox. The plantings will be assisted through work being undertaken by Coffs Coast Bush Regeneration and funding from Bellingen Shire Council. 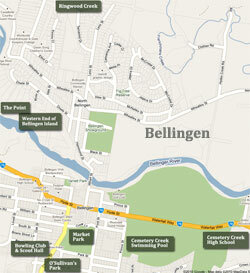 Access to the Western end of Bellingen Island is off James Eather Way at the end of Dowle Street North Bellingen. For more information you can check out our website (where you can also get information about the WEBI site including pictures and map). Remember to bring some sturdy shoes and something to share for morning tea. If you have any questions about the working bee please call Tim on 0499 783 353. P.S. To actually read about Jadav Payeng click here.